Mycket trevlig charmig lägenhet nära vingårdarna i Montmartre. Bilderna togs inom 100 m av lägenheten. Bo som en parisisk i det charmigaste distriktet i Paris. 50 m från vingårdarna Montmartre och vid foten av trappan som leder till Sacré Coeur. Du går nerför trappan och du har alla nödvändiga butiker att köpa mat eller gå till restaurangen. 3-rumslägen ligger i hjärtat av en lugn och typisk gata i Montmartre. Det ligger på översta våningen i en typisk liten Montmartre-byggnad. Mycket tyst lägenhet (väldigt få bilar döda) och mycket soligt. Från våren hör du bara fåglarna !! Perfekt för 4 pers. Fräscht och prisvärt. Ett par minuter från Metro och Montmartre/Sacre Coeur. Good location for restaurants, market and bakery. Overall good. Washing machine instructions on site would have been helpful. Bathroom not convenient as you have to pass through a bedroom to access. Some floor boards need some repair. L'autre petit inconvénient est qu'il faut passer dans l'une des 2 chambres pour aller aux WC et douche.Machine à laver le linge à changer ou réparer car le linge revient presque plus sale qu'avant. Malgré ces petits inconvénients mineures nous avons passé un excellent sejour. We very much enjoyed this apartment although you must be prepared to walk a lot of stairs both in the apartment and in the neighborhood. We found the area nice because it was lively but not overly touristy right where we were. It is an easy walk to the Sacre Cours, metro station, and cafes. You can get anywhere on the metro in a relatively short time. We were fortunate enough to have been visiting when the weather was very accommodating so that added to our pleasant stay. The apartment was more than sufficiently large and functional to handle me and two older teenagers. There is only one bathroom but we managed because we were out most of the time. Tristan left detailed instructions and was very responsive to any inquiries we had. We'd stay here again. 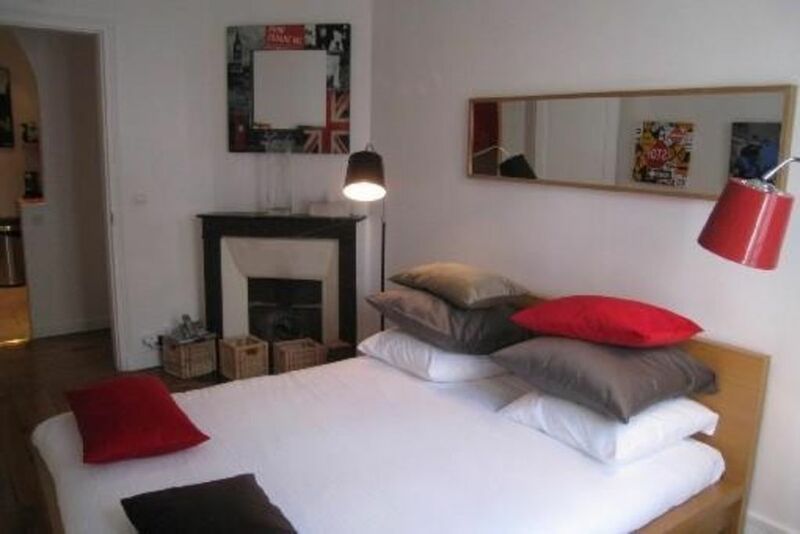 First time in Paris and first experience with VRBO. Worth! Staying June 1st to 5th, 2016. We are a family of 5, with three kids (youths). Definitively a good choice to look for a flat. Rather than hotel, in Paris, more flexibility, more space, more convenient. Monmartre has been a good place to stay. Nice place to have easy walks around also in the evening when you are tired after a long visiting day. Mostly because our flat was nearby the Sacre Coeur and the charmy neighborhoods. Regretfully, I cannot say the overall area was clean. Quite dirty streets and excrement on every corner. It’s a pity. However, let’s talk about the flat. Good choice, plenty of space for the family, all the commodities you may need for a short staying. In general I found it reasonably clean. Clean kitchen. Clean bathroom. Clean lines. Making a correlation age / usage / services I score it worth. When arrived, I followed the instructions given by the owner. Everything matching and precise. Nice organization. The flat we had was the one at the 4th floor. Surely tiring to get up as there is no elevator but, I would say, it’s part of the fun from a certain prospective. Surely better to be the last one rather than having someone else above you maybe with lack of care when walking inside. We tried to pay respect by not using shoes inside and paying attention not to make hit. No complains about neighborhoods or noises. I didn’t meet Tristan but he was prompt in replying and providing me with info whenever needed via e-mail or sms. If I’m allowed to make a comment, the only part I did not find very clean was the sofa-bad when we set if for sleeping. I deem the cleaning service you pay found some shortcuts to be faster!. However, nothing major. We arrived from CDG airport via TopParisTransfer. 70€ well spent considering the cost with other options Vs logistic and time to get there. The nearby station of Lamark is fundamental. With the line 12 via switches you can get everywhere in a short time. We bought the ParisVisit card. Winning choice indeed. Return of investment is really short. All around there are many places where to eat, to buy food, pastries, baguettes or, to eat outside. So, in the end, apart from the week we chose was not the best one (bad weather and the Seine flooding!) I score the experience positive and I would recommend the flat we used to others. Thnak you for your very long and detailed answer. I am sure it will give a clear idea for other customers. Glad you loved your stay in Montmartre. Hope to see you again. Det finns inte mer romantiskt än Montmartre. Titta på kartan och du kommer att upptäcka att lägenheten är idealiskt beläget för att upptäcka Montmartre till fots: Sacré Coeur, vingårdarna, Place du Tertre, distriktet Abbesses, Rue Lepic och Amélies kaffe. Det har varit 40 år sedan jag bor i Paris. Jag bor för närvarande i den 9: e med våra 3 döttrar (Opera) men det är en mycket speciell känsla varje gång jag går och jag har kul att förlora mig själv i Montmartre. Montmartre är en by i staden. Utan tiden. Det är som om tiden har slutat. Det är nödvändigt att bo där för att upptäcka denna speciella atmosfär. Promenera på gatorna som San Francisco, klättra uppför trapporna, upptäck hus, vingårdar, gränder, små handlare. Det är också perfekt för att besöka Paris till fots. Tunnelbanan vid 100m är Lamarck Caulaincourt, linje 12. Du är 10 minuter från Concorde och 15 minuter från St Germain des Près.